Yesterday, my little Araucana blessed me with a lovely, little green egg. It's gorgeous. I was hoping for either blue or green and had been eagerly waiting. See, all my other hens have already started laying, except for the little one, Lovey, who had the dog attack. (She's recovering nicely, by the way. Everyone has gotten wing-clipped, so no more traveling into the neighbor's yard.) 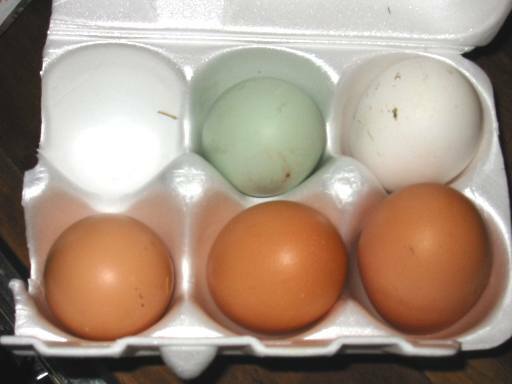 I've been getting brown and white eggs for several weeks now. 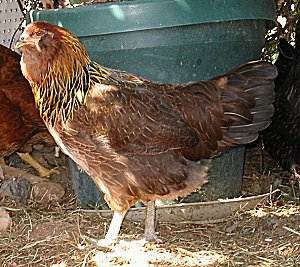 But up until yesterday, no eggs from the Araucana. Well, she finally caught up, and I got my first egg from her. Here's the first picture! The green egg is the one top center, of course. 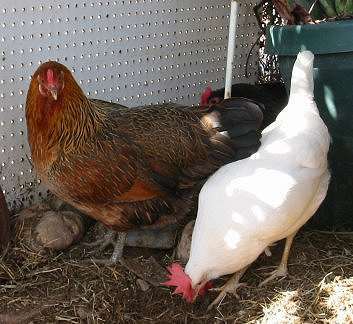 The white one is from White, my White Leghorn. The Araucana and White, my White Leghorn picking some goodies off the ground. 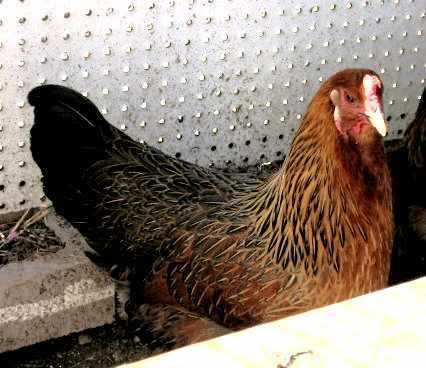 My little Araucana was scratching around the nesting area in the coop which is very unusual for her. She's hardly ever in there. She spent about ten to fifteen minutes scratching around some new alfalfa I had just laid down, sat in it, wiggled around, picked at it; but then moved to another spot. She did the same thing to five different nesting areas. After about an hour or so, I gave up hoping for the big event, and retreated into the workshop to pay some bills. 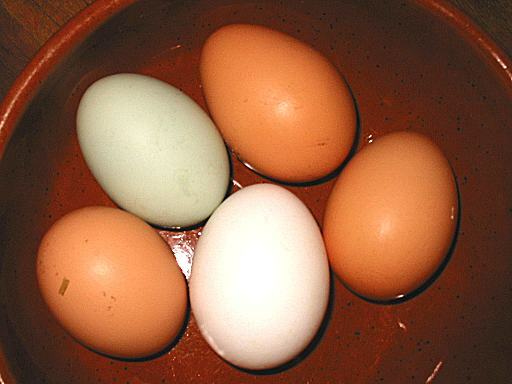 Just before work, I went out to give the dogs milkbones, and there on the gravel was her gorgeous pastel green egg. I was so excited. You can really see the difference between the green egg at 10:00 o'clock and three browns and the white egg at 5:00 o'clock. I put it up against my paint bottles, and it more closely matches a pastel green color. The closest color match on the Dutch Boy color chart is "Contemplation" #310-2. 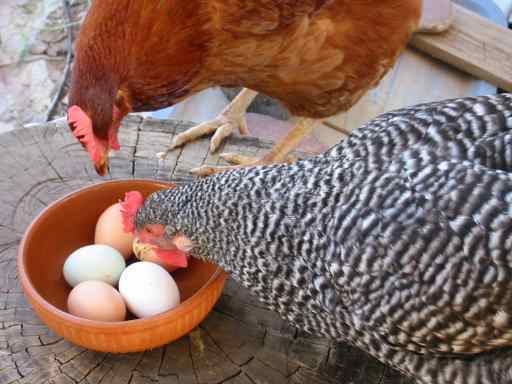 Here, Red and Spot are looking over the egg. 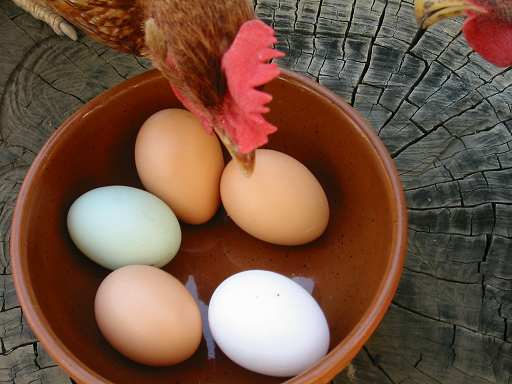 Can chickens see color? Here's a good closeup with Red looking on. 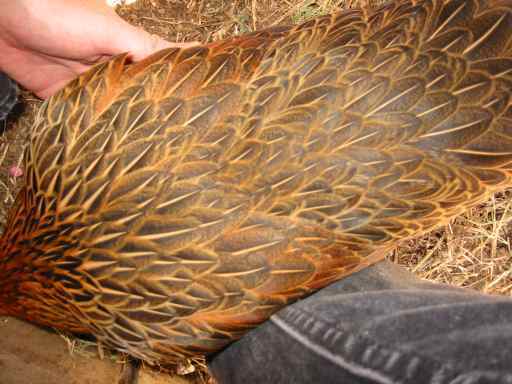 Here's my Araucana's beautiful back feathers. I love the patterning and color. She stopped for a belly scratch, so it was easy to get the picture with my free hand. She likes belly scratches. The background seamless tile on this page (sample above) is fashioned from this picture of her feathers. I selected a portion of the picture then ran it through my effects editor for oil painting then topography. The seamless editor was used to make the seamless tile. Pretty effect, don't you think? I wouldn't mind having this on the walls to a den or as a large wall hanging. Return to Kasin Hunter's main Tripod page.